Pendulum Effect: Each time a Spell Card is activated, place 1 Spell Counter on this card when that Spell resolves. You can remove 3 Spell Counters from this card; Special Summon this card from your Pendulum Zone and 1 monster with 1000 ATK or more that you can place a Spell Counter on from your Deck, and if you do, place 1 Spell Counter on each of them. Monster Effect: This card with a Spell Counter can attack directly. Once per opponent's turn (Quick Effect): You can discard 1 card; place 1 Spell Counter on this card and each card you control that you can place a Spell Counter on. 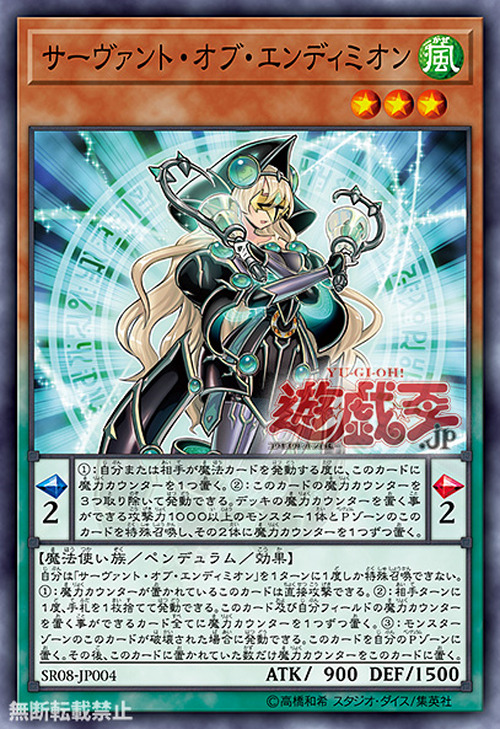 If this card in a Monster Zone is destroyed: You can place this card in your Pendulum Zone, then place Spell Counters on this card equal to the number of Spell Counters that were on this card. You can only Special Summon "Servant of Endymion(s)" once per turn. There is a total of 12 Spell Counters visible on this monster; they're visible on her robes. The said Spell Counters are colored jade, a greenish-blue hue closer to green; this refers to this monster's Attribute, which is WIND.